If your kids are like mine and love Chuggington, you can now find great toys for them that are perfect for summer! We received another traintastic package that included bubble blowers and balls – two things that little boys absolutely adore – so it was a hit! The bubble blowers are great because they work well for even little kids. We got the light-up Bubble Chugger that easily blows out a stream of bubbles (it is battery-operated). It retails for $8.99 and comes with a small bottle of bubbles and a bubble tray. 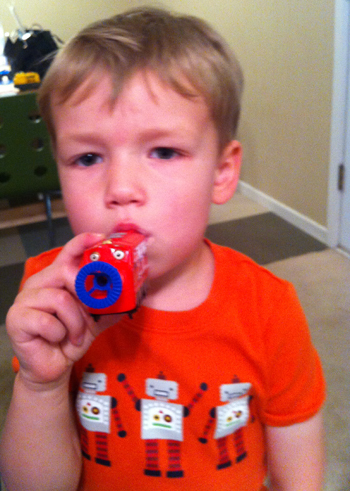 The Bubble Train Whistle is one that the kids blow through to both make a noise and produce bubbles. C has a hard time with typical bubble wands because he blows too hard for bubbles to even form, but this one worked great for him. It doesn’t hurt that you get to sound like a train while you’re at it – what little kid wouldn’t love that? This whistle is $3.99 and also comes with bubbles and a bubble tray. 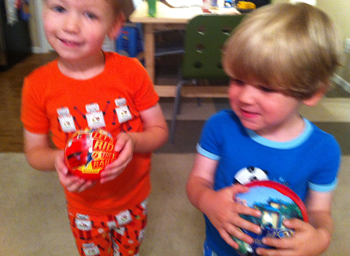 Along with the bubble blowers, we also got two small balls that are lightweight and covered with Chuggington artwork. They’re great for playing catch without worrying about anyone getting hurt if they get bonked in the head. :) The balls both retail for around $2.00-$2.50. As you can see, the boys couldn’t even hardly stand still for a photo with the balls – they were ready to bounce them! One lucky reader will win their own package of fun outdoor Chuggington toys, including the two bubble blowers and two balls! This giveaway is open to all U.S. & Canadian residents ages 18+. Entries will be accepted until the end of the day (midnight Central) Thursday, May 31. By entering this giveaway you agree to the Official Rules. Mandatory Entry: Comment on this post telling me what your favorite outdoor activity is to do with your kids! Note: I’m a Chuggington Conductor! I received the toys to facilitate my review, but was not compensated monetarily for my post. All opinions are honest and are those of myself and my family. The prize for the giveaway is also being provided. Your Kids Can Be Active And Learn, Too With the iBounce! I ‘like’ Frugal Novice on facebook. We like to feed the ducks! My favorite outdoor activity to do with my kids is swimming in the pool. We like to go out walking and see what we can see. I like Chuggington on facebook. I follow Chuggington on Twitter. I like frugalNovice on facebook. Signed up to receive your newsletter. Signed up to get updates in my email. 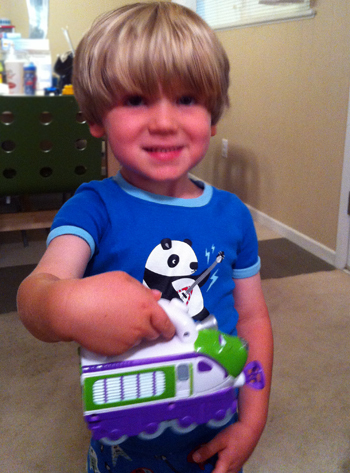 Chuggington DVD & Tommee Tippee Sippy Cups Winners!